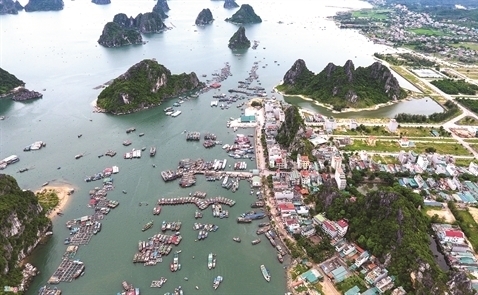 VietNamNet Bridge - Van Don, a peninsula with total area of 551 square kilometers, has changed its look rapidly since it became one of three ‘candidates’ chosen to try the special economic zone (SEZ) model in Vietnam. Billions of dollars have been poured into Van Don. By the end of October 2017, about $2.5 billion had been funneled into infrastructure projects there, mostly developed under the mode of PPP. These include the Van Don international airport project which is under construction. Once operational, the airport will connect the peninsula with large cities such as Shenzhen, Shanghai, Hong Kong or Macao in just 1-2 hours of flying. Van Don can also target a number of large markets, including a series of major economic centers in Asia with a population of more than 3 billion and a combined GDP value of more than $22,000 billion. Another project expected to give an impetus for Van Don to develop is the highway which connects Van Don with Mong Cai border gate. The project, capitalized at VND16 trillion, is scheduled to kick off by the end of the year under the BOT mode. By the end of October 2017, about $2.5 billion had been funneled into infrastructure projects there, mostly developed under the mode of PPP. Together with the Van Don – Ha Long and Ha Long – Hai Phong highways, which are nearly completing, the Van Don – Mong Cai Highway will help connect the important economic centers of Hanoi – Hai Phong – Van Don – Ha Long – Mong Cai. This will help stimulate capital, goods and traveler flow. A series of large-scale multi-trillion-dong projects have been registered in Van Don, SonaSea Dragon Bay (VND5 trillion), Bac Cai Bau Port & Urban Area (VND25.2 trillion) and other resort projects, turning Van Don into a ‘great construction site’. Van Don is the second place in Vietnam, after Phu Quoc, which has received permission to open casinos to Vietnamese. Under the tentative policy for Van Don, the SEZ will develop tourism, service, industry and agriculture. In the first phase of development, 2018-2022, it will focus on entertainment services (with casino), port services, aviation, trade, shopping malls, innovative technology and become a startup center. Regarding the administration structure, there will be one head of the SEZ, with no people’s council. Under a plan drawn up by the Quang Ninh provincial authorities, Van Don will need a huge capital amount of $12 billion in 2014-2030 to turn Van Don into a modern urban area. The required hefty capital and the limited budget will force Van Don to seek capital from many different channels, including private investors. However, capital mobilization from the public will depend on the openness of the policies.